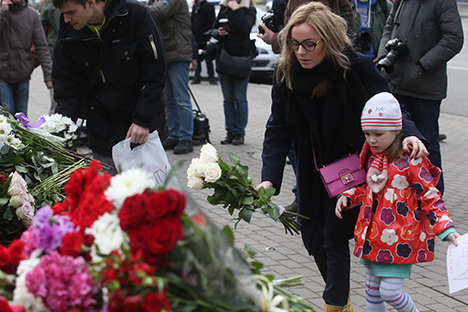 Citizens of Moscow lay down flowers and candles at the French embassy in memory of the Paris attack victims, November 14, 2015. The Russian Transportation Ministry will tighten security at transport facilities in the wake of the terrorist attacks in Paris on Nov. 13 night, Transportation Minister Maxim Sokolov told journalists on Nov. 14. "Definitely, we will take measures related to transportation security, which should reduce the risks faced by all those using the transportation sector," Sokolov said. All entities engaged in the transportation sector need to consolidate efforts to enhance security, he said. Moscow airports have tightened security measures following the terrorist attacks in Paris, a source familiar with the situation told Interfax. "The aviation security services at the Sheremetyevo, Vnukovo, and Domodedovo airports have received the relevant instructions and have started tightening control at the entrances to the airports and at examination points at the departures and arrivals areas," the source said. Aviation security services at the airports will attach particular significance to the contents of hold and cabin luggage belonging to departing passengers, he said. "Aviation security officials are seeking to prevent potential risks related to passengers' luggage and cargo. Before being admitted aboard aircraft, all hold and cabin luggage and all cargo is being carefully checked for the presence of items whose transportation is prohibited," the source said. He did not say how long the increased security measures at the airports could remain in place. Terrorists on a murderous rampage killed scores of people in multiple attacks in the French on Nov. 13. A French government source told Reuters there were 127 dead, 67 in critical condition and 116 wounded. Six attackers blew themselves up and one was shot by police. There may have been an eighth attacker, but this is not confirmed. The information available at the present time indicates that there are no Russian citizens among those who died or were injured in the terrorist attacks in Paris on Friday night, the Russian Foreign Ministry said. The Russian embassy to France is maintaining close contact with French authorities and is continuing to follow the situation, it said.